Our first MLK Day outing, 2009. It doesn’t feel like that long ago, but pictures would suggest otherwise. I was looking forward to a nice, quiet holiday at home today, especially after being out late Sunday night at an adult-league hockey game. Ryan was having none of it. He had something else in mind. 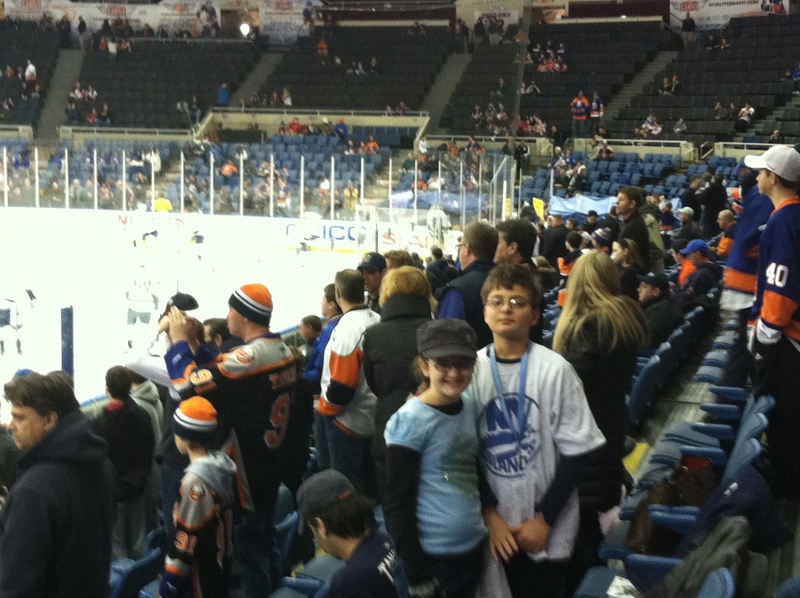 Five years ago, when Ryan was still a relatively new hockey convert, I noticed that the New York Islanders had a an afternoon home game on MLK Day. 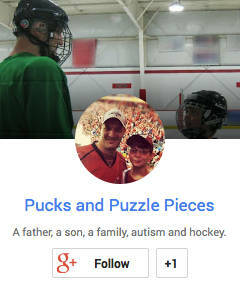 Better yet, it was against what was then Ryan’s (and is still my) favorite team, the Washington Capitals. 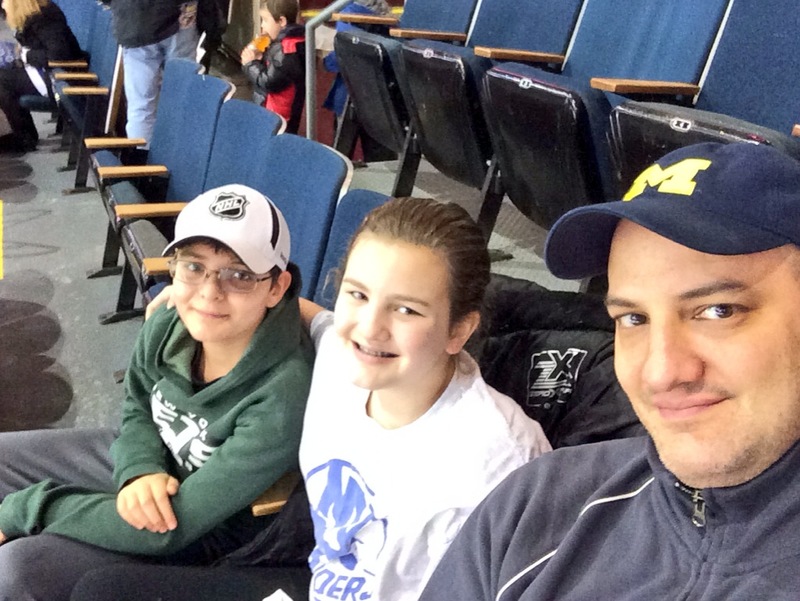 I decided to spend our Monday holiday heading out to Long Island for the game, with one special twist: I didn’t tell the kids where we were going, only that we were headed on an adventure. It drove them nuts trying to figure it out. As we cut across Manhattan, Riley thought perhaps we were going to a Broadway show. Ryan had no idea. The secret lasted until we pulled into the parking lot. As soon as he realized the building he was staring at was the Nassau Coliseum, Ryan got very excited. OH MY GOD WE’RE GOING TO A HOCKEY GAME! THE ISLANDERS ARE PLAYING THE CAPITALS TODAY! ARE WE GOING TO THE GAME? WE ARE? YES!!!!!!! 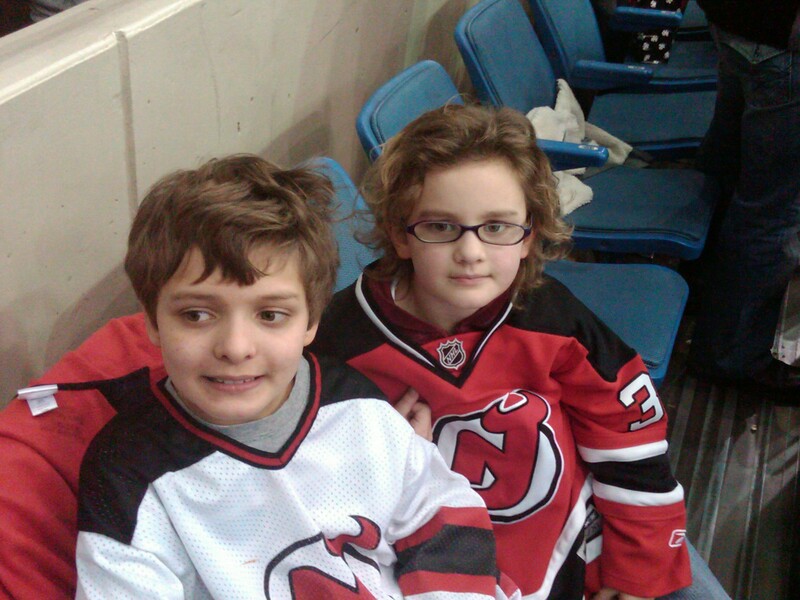 This was before we had season tickets for the Devils. Attending games was then a rare treat. 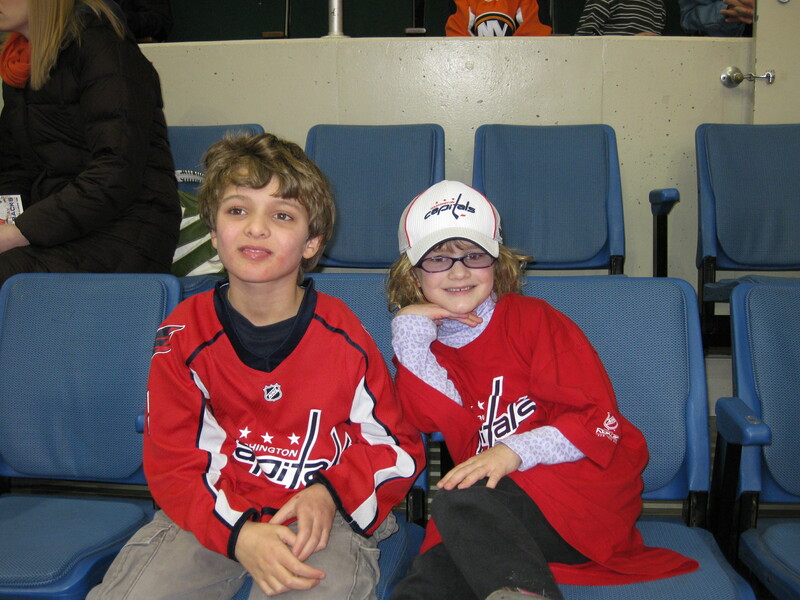 I got out the Caps jerseys and shirts I had secretly brought for the kids. We headed inside and watched the game from the best seats I have ever enjoyed at an NHL game. Alex Ovechkin, then, as now, the Capitals’ best player, scored both Washington goals, including one in overtime, to lift his team to victory. Both happened right in front of us. I remember the details of that game like it was last week instead of 2009, and yet it is hard to contemplate how far we have come in that time. I was genuinely worried about how I would manage by myself with Ryan, then just eight, and Riley, then 6. I kept a death grip on both their hands as we walked the crowded concourse. If anyone needed to go to the bathroom, all three of us went, so afraid was I of becoming separated. And yet, we managed — and created a lasting memory in the process. Back to the Nassau Coliseum, this time to see the Devils, 2010. We went back to the Island each of the next three MLK Days, twice to see the Devils and once against the Nashville Predators. Last year, I didn’t have the day off, and we weren’t able to go. For whatever reason, I didn’t raise it this year. In the back of my mind I knew the date was approaching, but I never asked either child if they wanted to go. Maybe I was subconsciously trying to avoid the drive, which is not a fun one from New Jersey. Our last MLK day trip came two years ago. What memories will today bring? His tone suggested it was not a question so much as an expectation. I offered mild protest about the drive, about being tired, about whatever. And in that moment, he had me. The fact that he recited the details of the previous four trips after I secured tickets for trip no. 5 was but icing on the cake. After all, you don’t mess with tradition. Those old photos show how much the kids have changed. Traditions are important and decades from now you will look back very fondly on MLK day’s spent with the kids.